EDMOND, Oklahoma (AP) — Vicki Toombs was watching the returns on election night 2016 when her phone buzzed — a text from her 22-year-old son Beau in Chicago. Beau, who is gay, was afraid that the new administration would end the Affordable Care Act and with it the insurance he and his friends used to pay for the drugs that protected them from HIV and AIDS. “I just felt the bottom drop out of my world,” said Toombs, 61. She felt she’d failed her son, as if Donald Trump’s election was somehow her fault. She had to do something. So, in one of the reddest cities in one of the reddest states in the union, Toombs sought out the Resistance. It wasn’t as easy as it might be in places like New York, Los Angeles and Washington, D.C., where multitudes of college-educated, predominantly white women have joined a rolling boil of activism since Trump’s election. The Democratic party and liberals are plentiful on the coasts, but light on the ground in swathes of the country that hold the majority of electoral votes and congressional seats. But even in Edmond, Oklahoma, Toombs has found her sisters-in-arms. 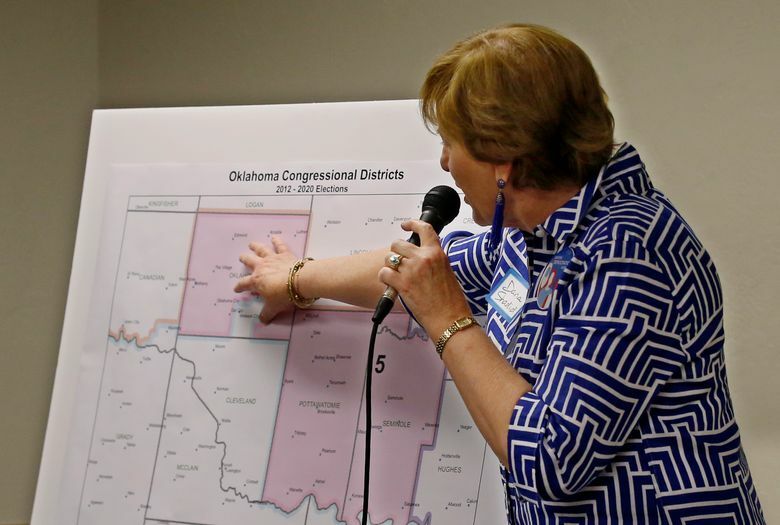 And it’s the reach of anti-Trump forces into red states like Oklahoma that gives Democrats hopes of a national resurgence, though no one suggests that the heartland will change its political allegiance on a dime. Regardless, the simple act of local liberals emerging from their shells has the potential to subtly change the dynamics in places like Edmond. 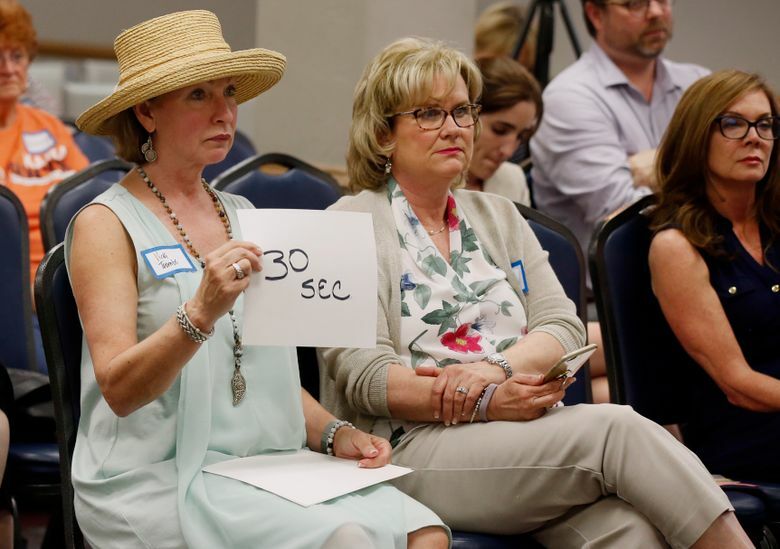 These days, Toombs texts her son to tell him about how she and her fellow activists have made calls and knocked doors for Democratic candidates running for special elections and helped win four of five legislative seats. 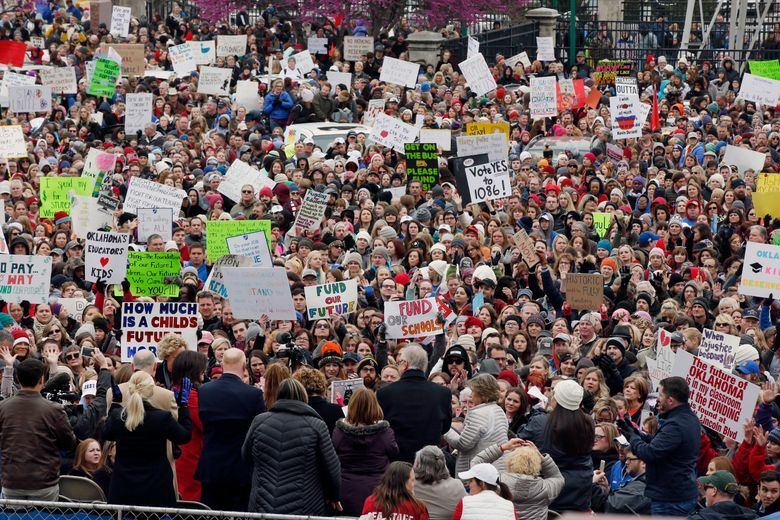 How they supported thousands of teachers who marched on the state capitol and won additional education funding from the GOP-controlled state legislature and Republican governor. How they helped recruit candidates for every possible office in November, from their local city council to state legislative seats where Republicans usually garner double the votes of Democrats. Jeremy Pressman, a political scientist at the University of Connecticut, has kept track of demonstrations since Trump’s inauguration with another colleague. They totaled 6,700 in 2017 alone, involving 6 million people or more, not just in liberal cities but in small towns in red states like Alaska, Michigan and, of course, Oklahoma. “We’re so used to seeing these maps every four years of us divided in red and blue, but these protests tend to make a counterpoint — in every red there’s blue and in every blue, red,” Pressman said. Still, it’s the same people who form the core of the movement — college-educated women, typically middle-aged or older. Even at the recent March for Our Lives in Washington, D.C., organized by the teenage survivors of the Parkland school shooting, the median age was 49, according to surveys conducted by University of Maryland sociology professor Dana Fisher. Chelsea Abney grew up surrounded by red. She was a reliable Republican herself until 2015, when she took an online quiz during the party’s crowded presidential primary to see which candidate she should vote for. The quiz told her she was a Hillary Clinton voter. After Trump won, Abney started volunteering for state legislative campaigns. Her father severed all ties with her but Abney was undaunted. “I couldn’t just sit here and watch the Kardashians anymore,” she said. 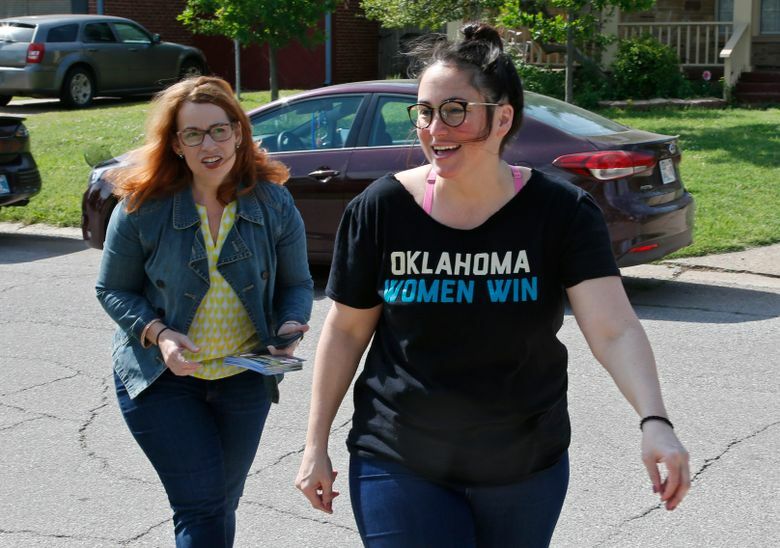 On a recent Sunday afternoon Abney gave marching orders to about a dozen canvassers who’d gathered in the living room of Danielle Ezell, Democratic state Senate candidate in Oklahoma City. 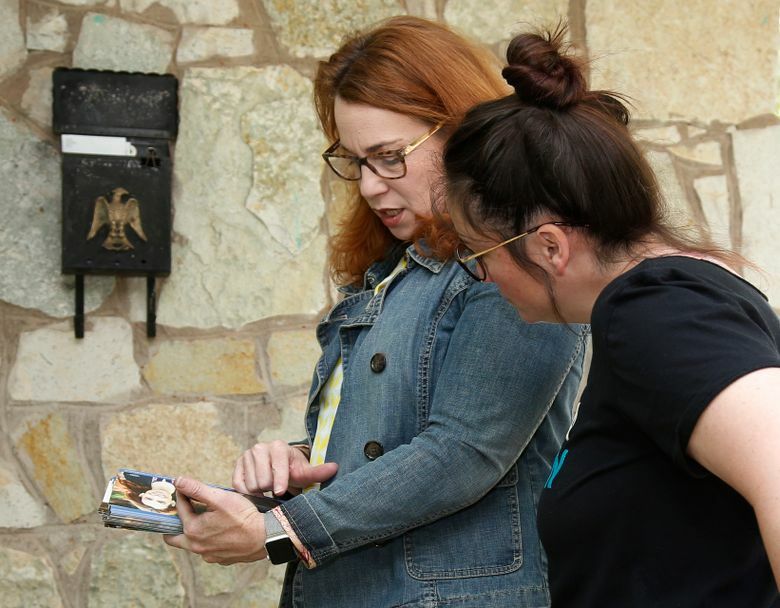 “It’s actually proven this is how elections are won,” Abney told the volunteers before laying out goals for the day — get commitments for three yard signs from the voters on canvassers’ lists. Taz Al-Michael didn’t need the pep talk. At 18, he volunteers for two other campaigns along with Ezell’s. Al-Michael, a college student, was brought to the U.S. illegally from Bangladesh when he was 9 months old. A program authorized by President Obama, that Trump wants to end, provides him with a driver’s license and protection from deportation. Trump’s election gave him purpose. “I just couldn’t take it anymore,” he said. Al-Michael knocked on the door of Carol Cater’s humble bungalow in a modest neighborhood in central Oklahoma City. Cater, 73, hobbled to the front and cracked the door open, her show dogs inside yipping. She asked Al-Michael, skeptically, which party he was with. When he said “Democrat,” she stepped outside. “You’re the first Democrat to come and see me. Everyone who’s come by is a Republican,” Cater said. She agreed to take a yard sign.